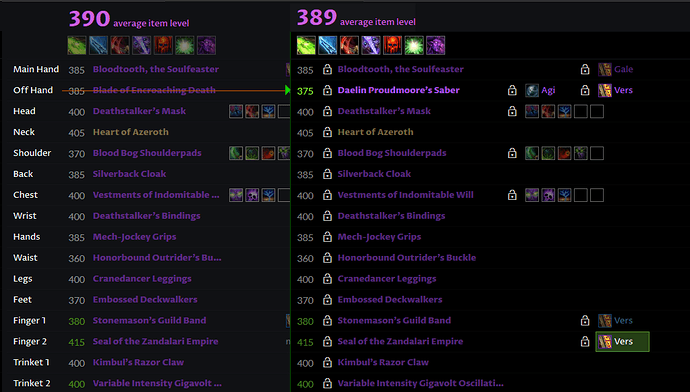 I cannot understand why this is, as I would like to see the DPS difference. I have tried opening and closing bags multiple times, restarting the client, equipping and unequipping etc, but it only sees those 2 weapons. Blade of Encroaching Death is a weapon with Strength and therefore completely missing your primary stat (Agility). As Demon Hunter is a class based on Agility AMR won’t recommend a weapon without it. While you could theoretically use a “wrong” weapon with much higher item level (e.g. the Blade of Encroaching Death at ilvl 385 should be comparable to a similar Agility weapon with ilvl ~350), having AMR consider “wrong” weapons would increase the amount and complexity of necessary calculations exponentially. @sassyrobot - you may want to update your add-on to v74… not that it’s pivotal to your issue. @asashdor Ahhhhh! Silly me! I usually play hunter, and only can only use guns/bows. I stupidly assumed that melee weapons would switch between strength/agility, like armor does. Thanks so much! @eighjan Yes, I have updated my addon also!